Internationally-recognized marimba prodigy with autism, Thristan “Tum Tum” Mendoza joins in celebrating the 2nd World Autism Awareness Day (WAAD) at a concert entitled “AutisMusical” on April 2 at the Activity Center of The Block, SM North, Quezon City, Philippines. The United Nations and autism organizations around the world observes the WAAD to promote early diagnosis, early intervention and necessary services for individuals in the autism spectrum. 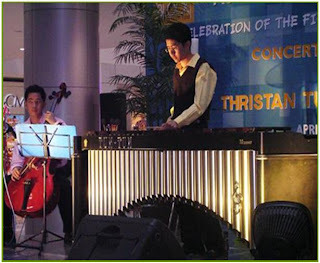 Only 19 years old, Tum Tum Mendoza has earned numerous national and international awards for his remarkable musical ability with the marimba. Tum Tum will share the stage with other talented Filipinos with autism in this WAAD concert, celebrating the unique talents and skills of persons with autism. In the past, he joined the stage with famous artists like Jim Chappell, the late Tadao Hayashi, David Pomeranz, Regine Velasquez, and the Philippine Madrigal Singers. Tum Tum has regaled Prince Abdul Fattaah and Prince Abdul Qawi at a charity concert in Brunei and reaped Millennium Dreamer’s Award from Walt Disney Company, McDonald’s and UNESCO. The University of the Philippines President’s Committee on Culture and the Arts named him the first and only gifted child prodigy and only special child among the recipients. The international media has shown great interest with Tum Tum’s appearance on CNN, Nickelodeon and NHK Japan. For this year’s WAAD celebration, Tum Tum will not only amaze his audience with his marimba playing, he will also be playing different percussion instruments after his successful recital in UP College of Music last March 14, 2009. “AutisMusical” is one of the events organized by Autism Society Philippines. ASP leads in the annual celebration of World Autism Awareness Day. Major sponsor is SM Malls and its SM Committee on Disability Affairs. Hope to see you on the 2nd WAAD celebrations at SM The Block. To see an excerpt of Tum Tum’s concert, click here. Come with your family and friends. SM Supermalls are autism-friendly malls.